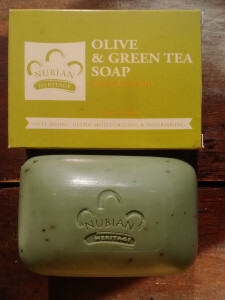 Nubian Heritage, a whole line of soaps that will never disappoint. These soaps are so natural that it will make you come back for more. I will often gift Nubian Heritage soaps to people that have never used chemical free soaps. Minus the one or two hard headed friends that just don’t get it, these soaps will most likely kick off your desire to chose more natural products in your life. As stated before, Olive Oil based soaps are awesome and very moisturizing and this soap has that and more. The virtues of Green Tea will tingle your skin and the Green Tea leaf bits in the soap will gently scrub your dead skin cells away. The soap has a pleasant smell of Olive Oil, Green Tea with a mild citrus back end. The soap will wash you clean and leave you feeling happy that you used something good for once in your life.